Ideal for tackling tall or hard-to-reach hedges, long reach hedge trimmers are indispensable if you’re trying to manage lofty foliage. These versatile machines are built with safety in mind, so that you can use them to cut above head-height without risking personal injury or fatigue. 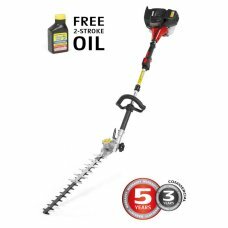 Long reach hedge trimmers are also great for trimming tree branches or tall bushes. Here, you’ll find long reach hedge trimmers from some of the best brands in the industry. Some models are petrol-powered, and geared towards tough jobs, but you will also find electric models for the average garden. 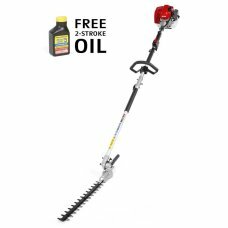 We’ve tried to offer the best possible price on all of our long reach hedge trimmers, and you should also find equipment to suit any budget. 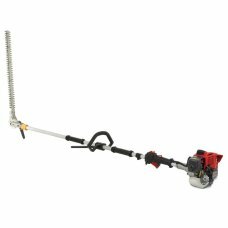 Cobra electric hedgecutters are designed specifically for homeowners who prefer light weight, powerf.. Powerful cordless long reach hedge trimmer with Li-Ion technologyDouble reciprocating cutter blad.. 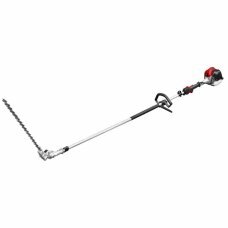 The Mitox 26LH-SP is a quality long reach hedgetrimmer powered by a 25.4cc engine with a split sha..
45cm hedge trimmer bladeHedge trimmer can reach 3½ metres20cm pole pruner attachmentPole pruner can .. The Mitox 28LH is a quality long reach hedge trimmer powered by a 25.4cc, full-crank 2-Stroke engine..
From Cobra, the LRH26C petrol Long Reach Hedgetrimmer powered by a Cobra engine is built to tackle t..
Cobra hedgecutters are packed with innovative and ground breaking features to help you create the pe..
Powered by a high performance, commerial grade Kawasaki engine and offering one of the longest manuf..
Mitox PROs new long reach hedge trimmer provides a commercial quality solution to trimming and shapi..